Cody and I are participating in the 2016 Lake Athens Fly Fishing Festival hosted by Johnny Martinez of JohnnyontheFly.com. This is the second year for this free fly fishing tournament. 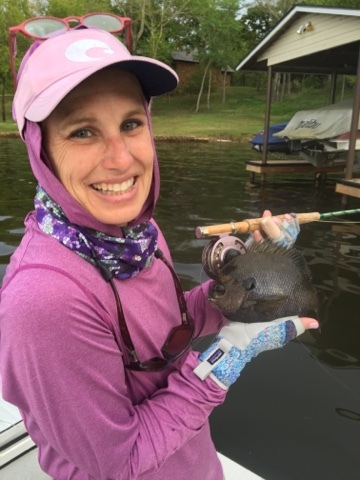 Today's event was the Sunfish contest where participants in two divisions--boats and kayak/shore--were tasked with catching five species of sunfish--a Bluegill, Redbreast, Redear, Green, and a Rio Grande Perch. 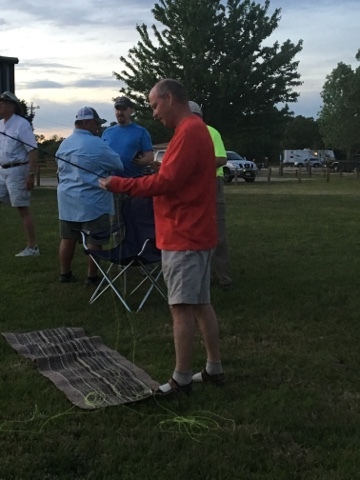 After catching a species, participants had to photograph their catch on a measuring board along with their tournament ID and text the photo to Johnny; incorrect IDs disqualified that catch! Tiebreakers were determined by total length of fish. In the boating division, Cody was one of six anglers who caught three of the five species. Unfortunately, Cody's total length did not put him in contention for the win. The winner had a total of 24.6". Afterwards, participants could choose to compete in an accuracy contest and a distance contest, as well as receive free casting instructions. Cody had the lead for distance when the evening ended. I hope it holds through tomorrow's participants. For supper we had fried catfish, grilled Italian sausage, cole slaw, potato salad, fried onion rings, and cookies. We received a neat, free t-shirt and raffle tickets with our entries, and during dinner, raffle items were given away. Cody won dinner for two, and I won a t-shirt. Even though we didn't win, we had a great time catching fish! What did you use to catch the Italian sausage. Why fly Italiano, of course! Enjoy your humor, Joe! 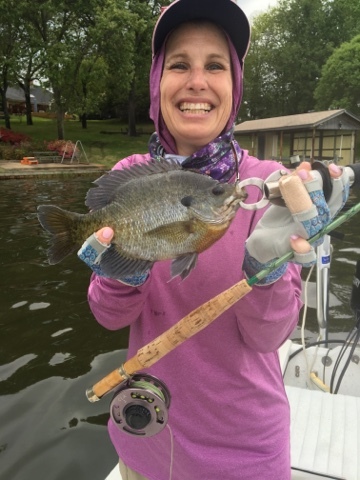 Unbelievable bluegill, what weight fly did you use to land that monster? 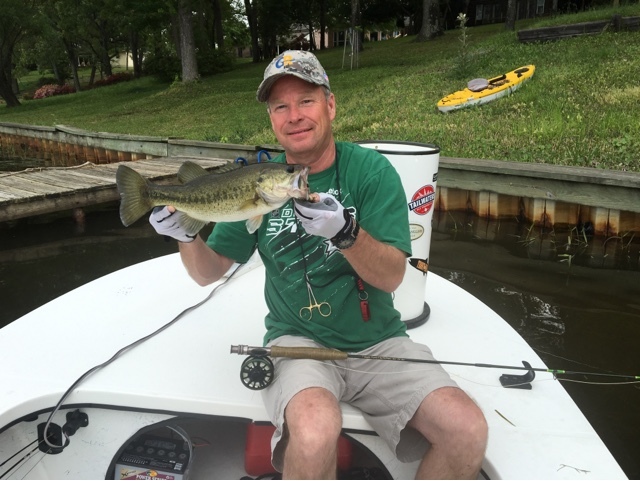 We both were using TFO Finesse rods we built ourselves. Cody's was a 3# with Galvan reel, and mine a 2# with a Ross CLA 1.